For those understandably wondering what the hell is going on, here’s a little context. 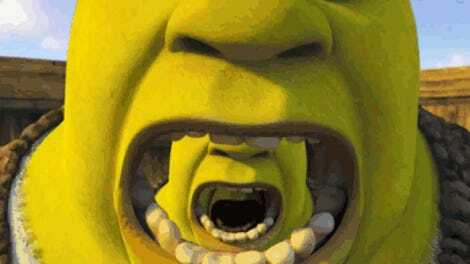 In the 16 years since the first Shrek film was released, the smirky, farting ogre has evolved from being a surprise one-off hit to a tired money-grabbing franchise to an endless stream of dank memes. Starting with the infamous “Shrek is love, Shrek is life” 4chan meme, the character has become a bit of an obsession in the dark corners of the internet and has inspired some truly bizarre content. That’s partially due to the fact that, for a generation of kids that grew up in the early-2000s, the Shrek franchise encapsulates the spirit of post-9/11 American culture, still reeling from the nihilist, irony-obsessed 1990s and crumbling under the weight of late-capitalism. Also, Donkey is pretty funny. That, combined with a little old-fashioned nostalgia, is what brings us to Shrekfest, where dozens of people are willing to don green face paint, sing along to Smash Mouth, and compete in onion-eating contests with brazen enthusiasm. It’s not clear if anyone at this event is participating with any degree of ironic detachment, but that’s ultimately because, in the world of Shrek fandom, irony has lost all meaning. So, be sure to keep your Labor Day weekends free, because planning for Shrekfest 2018 is already underway.